The formation of Midwinter Entertainment is giving CEO Josh Holmes a second chance. Like two of his three fellow co-founders, Holmes hails from Halo developer 343 Industries - in fact, he was studio head and creative director before leaving to form the new company. During his stint at the Microsoft studio, one project didn't quite turn out the way he had hoped. Holmes and many of the Midwinter team were instrumental in the creation of Halo 5's Warzone, a multiplayer mode that aimed to "bring together the best aspects of the campaign and PvE with the best aspects of competitive and PvP." In other words, pitting online players not just against each other, but also AI-controlled factions. "What we created was really special and something I'm very proud of, but ultimately the mode ended up being more competitive than we had originally intended," Holmes tells GamesIndustry.biz. "We're lucky that we have some famously vicious troll players on our team - I count myself as one of them"
"We were quite surprised after the first couple of weeks at just how much players were able to game the system and understand exactly when events were going to happen, the optimal load-outs for every moment in the match, and even able to organise a large-scale team to control and shut down the other team. Because of the design of the maps, with very distinct choke-points and everything, I think it became much more PvP-focused than we had intended and that became the optimal strategy to win." 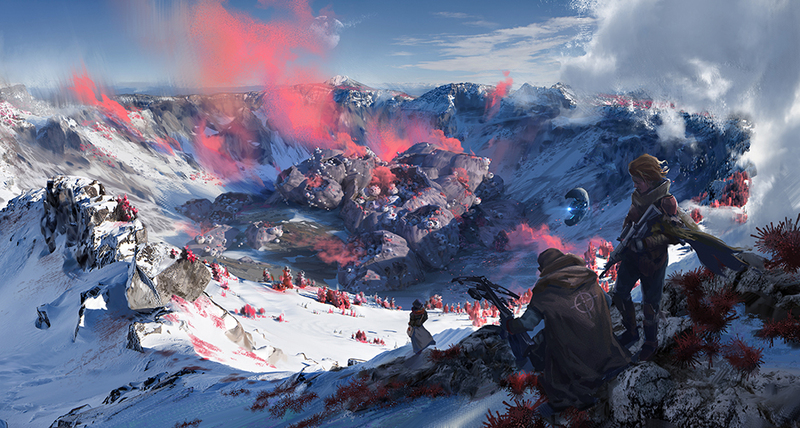 Enter Scavengers, Midwinter's debut project and an evolution of the Warzone concept. Players battle for survival in a frozen wilderness while trying to complete a series of objectives, not only battling other gamers and AI enemies, but also the very elements themselves. While the concept may be similar, Holmes is determined to avoid the pitfalls that Warzone ran into. The focus this time is on a better balance between PvP and PvE, ensuring that players who want to focus on the latter can still accomplish their goals, and those that prefer the former don't automatically dominate each match. "I think we learned a lot [from Warzone], and we keep talking about it as we iterate on the game," he says. "We also discover a lot through playtesting, and we're lucky that we have some famously vicious troll players on our team - I count myself as one of them. We realise that players will take advantage of any tools that you give them, and griefing is going to occur in every experience. We just have to be aware of that, and look for all the opportunities to make sure we're providing balance there. "I don't think there's any silver bullet or anything, it's just about being constantly aware from a design perspective and playing the game relentlessly." "We realise that players will take advantage of any tools that you give them"
Midwinter is positioning Scavengers as a "co-opetition game", a quirky little phrase that emphasises the need for teamwork. Holmes admits that encouraging co-operation without forcing it is "a huge challenge, and something we dive into every day," but he remains confident that the structure of the game ensures no single player can disrupt a match. This is helped in part by the game's classes, each of which have their own advantages, as well as a crafting system that enables players to build and share essential items. "Players can't get everything they would want without working with one another and trading with team members, so that's a great way of encouraging co-operation," says Holmes. "The other thing is you really can't survive our world alone. There are so many times you're going to need your team's help - whether you get downed by an enemy, or you're struggling to survive the cold and need somebody to offer you an item that will help stave off the different survival mechanics you're dealing with. Those are things that we think encourage teamwork." The need for co-operation also raises another challenge: communication. Holmes is keen to avoid solely relying on voice chat - "you're not always going to have everyone playing together on a Discord server" - so it's exploring ways to visualise each of the game's systems in the UI, to ensure its mechanics are easily understood. If Scavengers sounds like an ambitious game, it's aided in no small part by the technology under the hood. Not only is the game built with Unreal Engine, it is also powered by SpatialOS. Improbable's technology, Holmes says, is absolutely instrumental to realising the Scavengers concept. "We always want to lean towards putting more power in the hands of players to create emergent fun"
"One of the biggest things quite simply is scale," he says. "We want to create a vast open environment that feels alive and is densely populated with players, enemy AI that provides a distinct threat, as well as neutral wildlife for you to engage with. Any time that you're trying to simulate that level of life and density, it becomes a massive challenge to do that on a server. "SpatialOS gives us the advantage of higher density, more reactive AI, and the ability to scale the experience from where we will be at launch, to [where we want to be] if we decide we want to expand the world. It's easy to bring computational resources that add to that, and I think those are some of the unique advantages SpatialOS offer from a development perspective." Midwinter is using the technology to explore the possibilities of permanence that Improbable has championed for so long. 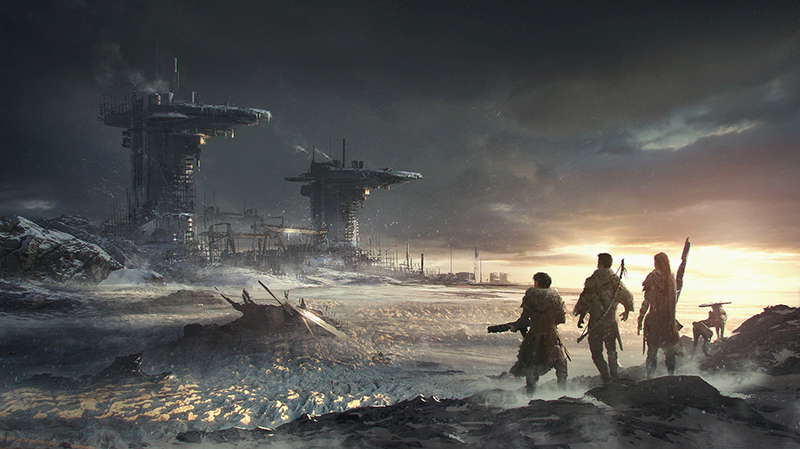 As players explore the world they leave footprints in the snow that can instantly betray their presence to the enemy. If they shoot down a tree they can use the fallen trunk as cover, with SpatialOS recalculating path-finding for the AI on the fly. "In a traditional multiplayer game, that would not be something that's... I won't say it's impossible, but I would say it would be very computationally complex and take up a great amount of your processing power to make it a reality," says Holmes. "Those are some of the things that get us excited about SpatialOS, being able to create a dynamic world." Yet as Holmes has already said, any tool you give to players is one they will inevitably take advantage of - and what is a dynamic world if not another, more unpredictable tool? How, then, can Midwinter avoid a Warzone scenario where players use the very environment against their enemy - and by extension the developers - to unbalance the game? It is, for Holmes, part of the "constant tension of designing a sandbox game." "When you see how players use tools, how they exploit them, you come up with ways to balance against them," he says. "We always want to lean towards putting more power in the hands of players to create emergent fun. If they abuse that in some way, we'll look at what we can do to mitigate that, either by providing a counter to it, or finding a system that helps avoid the problems that emerge." @Alfonso Sexto: My impression was that they're not saying that griefing is part of the game and that players have to "deal with it", but rather that griefing is an inevitability in online multiplayer games and that devs have to be vigilant against combating it as best they can.